Diaphragm filter is widely used in the coal industry, slime water dehydration treatment, making the coal preparation plant to achieve zero discharge of coal water. It achieves a closed circuit of water, not only could save water resources, but also can improve resource utilization. In the decontamination section of coal, quick opening membrane filter press can reach 4-6 cycles / hour. Because of the large capacity, high efficiency, low running cost, make its gradually replaced the traditional pressure filtration machine, disc type vacuum filter machine. 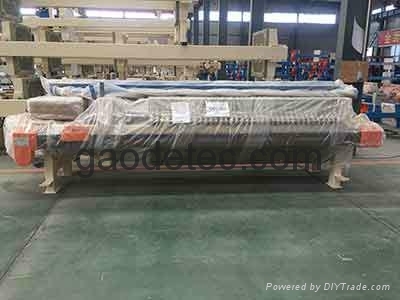 If any interest, please contact us freely at info@gaodetec.com.